A Passport To Freedom; Following Domestic Violence, a Publicized Divorce & Cancer. Embracing a complete change of lifestyle and travel in the face of adversity, Janice Lintz shares her story, along with a challenge, to visit every country in the world. Janice Lintz originally told her story in The Outdoor Journal in February of 2019. Recognising the importance of sharing Janice’s story, The Outdoor Journal has permitted Thrive to repost those same words via the article below. At the end of January 2019, The Outdoor Journal’s Sean Verity attended The New York Times Travel Show and reported on an industry event that left him shocked at “expert” panels bereft of expertise. During the panel, an audience member stood up to ask a question about social media followers – but was told that her story was perhaps “not good enough”. We subsequently spoke to Janice Lintz and invited her to contribute to The Outdoor Journal. This is her story. I knew that leaving a physically and verbally abusive marriage was going to be difficult, but I had no idea that it would take eleven and a half years. I’ve still not completed my escape. The process of “uncoupling” was physical, mentally, and financially exhausting. Travel became my respite to detox from a judicial process that enabled a wealthy spouse to do what he could no longer do with his hands. Despite being an attorney, the court was terrifying. The judge routinely, blatantly ignored New York State’s laws and even the court’s own orders. Having worked to change the world for people with hearing loss, I thought that I could quickly correct the legal issues. But testifying, meeting with politicians and writing letters accomplished nothing, as I explained in the Huffington Post. I came to the conclusion that the discussion about domestic violence was conjecture for ordinary women. Did I need to be well-known to matter? The more I spoke out, the more the judge used coercive tactics meant to silence and terrorize me. This included placing me in handcuffs and threatening to send me to prison on Riker’s Island. On one occasion the judge threatened to send me to the jail for 21 days when I demanded that she enforce my support order. Rather than address my ex-husband’s non-payment of my court-ordered maintenance, she chose to punish me for speaking out of turn. On the final occasion that she tried to punish me, I used my one phone call to call Vice President Joe Biden’s office. Thankfully, at The United State of Women Conference, where I was a nominated Changemaker, I sat next to Jaimie Woo who headed Biden’s Domestic Violence Taskforce. Miraculously, ten minutes after my phone call, the judge decided to release me. The trauma of that day didn’t end when the handcuffs came off. I don’t even remember how I made my way home, whether it was a taxi or the subway, but the moment I had finished my journey, I wanted to flee. I felt like an escaped convict seeking freedom. I didn’t care where I went, I just wanted to get away from the toxic environment that treated me as if I was an entitled woman with no rights. The judge in my divorce treated me as if I was an entitled lady who “lunched”. I was lucky in many ways, but in reality, during our marriage, I worked for free to change the world for people with hearing loss on behalf of our daughter and others like her. 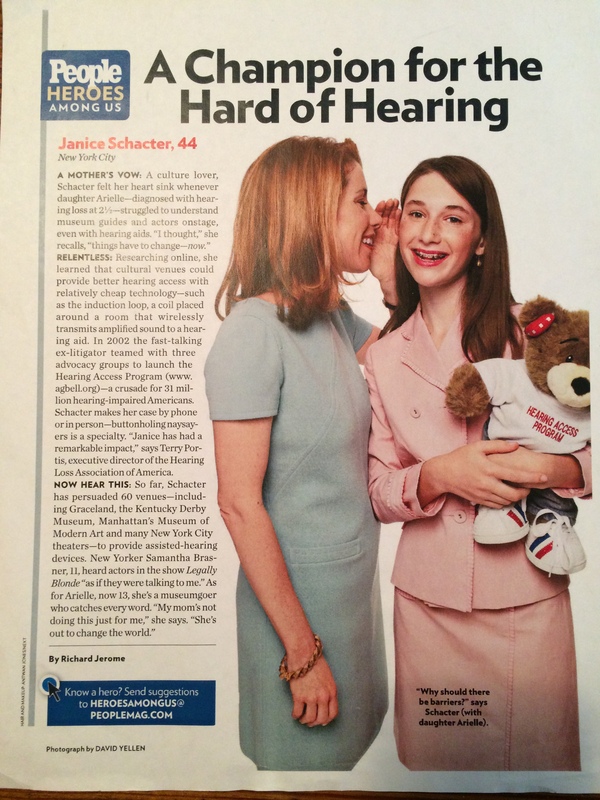 Our daughter was 2 1/2 years old when we learned she was hard of hearing. After advising me of her diagnosis, the doctor told me there were “special schools” for her. My idea of “special” was the Ivy League University that she would later attend. At the time, I didn’t like someone limiting her opportunities before she had even started. Rather than accept the crumbs offered to her, I set out to change the world, since it was easier to change the world than my own standards. As explained in Forbes magazine, I used New York City as a model to design, create and implement best practice standards before going international, to include Greece, Canada, Switzerland, Netherlands, Korea, and soon Ecuador. You can find out more about hearing access here. Further to this, in the United States, I helped to develop captioning standards that were the basis for the Federal Communication Commission’s captioning rules. When I approached Senator Warren about the hearing aid monopoly, she then introduced and passed an Over-The-Counter Hearing Aid bill with Senator Grassley. Hearing access in museums and theaters in New York City became the model for access around the country including locations such as Graceland in Tennessee, The Getty in California and Mill City Museum in Minnesota. Airlines subsequently added captions to in-flight entertainment after I worked with Virgin and Delta Airlines. Delta also added induction loops in airports starting with Atlanta, GA, and Detroit, MI. The National Park Service created Guidelines for Accessibility after I testified before the National Park Service Subcommittee. Finally, I also ensured that cell phones maintained the telecoil, which provides hearing compatibility rather than proprietary technology. During my marriage, I always worked without pay. Equally, I never accepted anything in substitute of pay, to ensure that no one questioned my motives. Suddenly, this judge treated me like a freeloader who mooched off her husband, rather than a team who worked together for the benefit of their family. Fortunately, having returned home from court, I could lean on a stash of frequent flier points from my divorce settlement, and from sign-up bonuses that I earned from opening 70+ credit cards in order to pay off my attorneys. My passport, coupled with my priceless “slush fund” of about three million miles, provided me with the freedom that I needed from the insanity of life. First up? I had decided to use a sign-up bonus of three complimentary nights at a Ritz-Carlton property to visit Aruba to celebrate my upcoming birthday. A quick scan of flights revealed some availability, so I booked a trip to leave the next morning. The trip was glorious. While the judge had used the divorce proceedings to treat me as if I didn’t matter, the manner of those working at the hotel thought otherwise. My birthday was celebrated, and being taken care of, and made to feel like I mattered was just what I needed to restore my spirits. However, these positive feelings that my vacation had offered were brief. I returned to find a broken pipe in my house’s basement. I had no water, which meant I had no basic amenities. My ex-husband and the judge ignored the order and requests to have my ex-husband make household repairs. Thankfully, the insurance company wielded their power. For four months, I was “stranded” at The Surrey Hotel on Manhattan’s Upper East Side which became a luxurious prison. My ex-husband knew that I couldn’t travel if the insurance company was paying for a hotel, so in my opinion, he delayed the process to stop me from flying. The insurance company advised me to eat my meals at the hotel restaurant, which happened to have a Michelin star. Either that or equivalent restaurants around the city. I was terrified to spend, given how I was treated in court. I only ate one meal out and ate yogurt for breakfast and lunch to not gain weight. As I told the insurance agent, free is not free if it’s on my hips. Still, given the opportunity, I decided to cross-reference the Michelin list, Eater 38, Eater Heatmap, Zagat, World’s Best List, and any friends’ recommendations to develop a dining list. Four months in a single room can be tough unless you are dining at New York City’s finest. I turned my time at the hotel into a “steakation” and developed my own hashtag,#IAteManhattan. Never one to waste a crisis, I ended up visiting every New York City’s Michelin star restaurant, except for sushi (I’m not a fan). It was around this time that my friends and I noticed that I hadn’t put on the weight that I should have, given the amount of food that I had been eating. I hadn’t suddenly developed a miracle metabolism. Doctors couldn’t find anything that was wrong with me, but there was a concern, so I was monitored. When I finally returned to the townhouse, the temperature was 94 degrees, and of course, the home’s air-conditioning didn’t work. My ex-husband had refused to fix it, and this time the insurance company couldn’t help me. Rather than melt, I tapped into those air miles again and fled to the Caucuses, Lebanon, and Italy. I suspected that I was sick, but I also knew that I needed a trip before the medical ordeal started. I returned home to find out I had incorrectly diaried my COBRA (COBRA is a federal law that requires employers with 20 or more employees to offer continuing coverage to individuals who would otherwise lose their health benefits) expiration date. All of a sudden, I had a month to visit all my doctors, and importantly, find a new insurance plan. I raced around New York, visiting many medical providers, until I learnt that I had thyroid cancer, and potentially breast and blood cancer as well. Over the next two weeks, I had six medical procedures and surgeries. The final surgery took place on the final day of my COBRA coverage. It’s a strange thing to say, but thankfully, I only had thyroid cancer and it was caught early. Over the coming months, the doctors monitored many other issues including a potential lung cancer diagnosis. The cherry on top, caused by was thyroid surgery, was an immobile vocal cord. I could barely speak for four months. I was deflated. My voice was my power, and once again I had been silenced. The upside was that this gave me a lot of time to reflect on my life, a life that had changed for many reasons, including children that had now grown up. Over the years, on behalf of my daughter, I had accomplished so much for hearing advocacy, it was now time to take care of me. My biggest dream had always been exactly that, a dream, and had I always expected that it would stay that way: To travel to every single country in the world. Like many of us, I had already made significant inroads into my quest through vacations. However, should I wish to actually achieve my dream, then I needed to focus on the endeavour. I also wanted to experience each country, rather than just race around the world. Without a conscious motive, I “Marie Kondo’ed” my life. I sold my five-story Upper East Side Manhattan townhouse (I know that I was lucky to be able to do so) and downsized to a 650 square foot (60 square meters) one-bedroom apartment in Brooklyn. Leaving Manhattan, where I lived for the last thirty years, and reducing my space was going to be difficult but living on my own for the first time in my life was exhilarating. Anything I didn’t love or wasn’t the color blue was sold, given away or donated, including my car and televisions. I cut the cable, landline and fax cords and every expense was examined. I viewed every object as a potential hotel night or tour guide. The shackles had been removed, I was finally free to move and realize my dream. However, as I had a weak voice, I decided to leave on a test run, to see if I could physically handle travelling. Determined to cross another destination off my list, I flew to El Salvador. This trip kickstarted my passion for travelling again, it renewed my energy which had been zapped after losing half my thyroid. My medication still wasn’t being regulated, but I knew that after hiking up Santa Ana Volcano and seeing the fantastic milky green crater that I could handle an extended trip. Slowly but surely, my dream had started to become a reality. I organized my new life and started to plan trip after trip. My initial goal was to travel for four weeks, come home for the next four to undergo medical tests, and then depart again with this sabbatical from life continuing for two years. Life rarely works out as planned, so it’s been a hodgepodge of planning, often whilst on the road. The never-ending legal drama taught me to be comfortable being uncomfortable, so I can easily pivot when I need to change plans while on the road. My visiting museums around the world dedicated to genocide, slavery, racism, and the Holocaust helps remind me to persevere even in the most trying of times. My issues are annoyances rather than a crisis. Where to go? I decided to make a list of the things that would hurt most to miss out on, should I die tomorrow. Gorillas and polar bears were at the top of that list, but I also added unicorns so that I always had an excuse to never finish travelling. The journey was unforgettable. A witch doctor in Côte d’Ivoire, dining among hippos in Burundi, eating at a restaurant on a rock in Zanzibar, chimpanzees in Uganda, the Dinkas in South Sudan, swimming in the waters around Comoros, climbing the Tsingy in Madagascar, snorkelling in the crystal clear waters of Mozambique and riding on a quad bike in Malawi. Of course, the main objective was also achieved – I met the gorillas in Rwanda. For seven weeks, I was in heaven. I didn’t think I could top this trip, but each adventure has been just as amazing. Over the coming years, I will continue to pursue my dream, and I hope that you will join me on every adventure. The Outdoor Journal will be with Janice throughout her adventures. In the meantime, you can find out more about Janice here, and follow her on Instagram here.